The Epica TM Accupro review takes a good look at this digital kitchen scale to see if it the good rating are true and it is really a good scale. It weighs up to 11 lbs and this is comparable with most scales for home and kitchen use. The 2 triple A batteries are included in the package of the Epica Tm accupro an instant start. This scale comes in the two colors silver and black. Maximum weigh capacity is 11lbs and this can be read in lbs, ounces, kilograms and grams in small graduations of 0.05 ounc and 1 gram. This is efficient for most normal kitchen and household use. One plus is the tare option and I can not believe that any digital scale should come without this option. “As our family is beginning to get into healthier eating it was necessary to buy a handy kitchen scale. I chose the Epica scale based on the features and price. I was not disappointed. The scale looks great and sleek on our counter top. It is just the right size for our needs yet not so big to take up precious counter space. The digital display is very clear and easy to read. The capacity is 11 lbs., more than adequate for all my kitchen use. Like you are used of us we always look at the lower ratings first to see if they have something in common. In this review we found a few things that the lower ratings shared and that was the scale not working or reading an error when received. It seems that the quality control could be improved and scales are not always tested before shipped or maybe get damaged in the shipping process. If we look at the numbers than we talk about less than 3% of the total. You can agree or not but I think this is still to high of a number. On the other side of the ratings I can only find a few minor flaws that are not to serious and most users are real happy with this kitchen scale and many of them claim they would buy it again. The ratings up to 3 stars mentioned sometimes that the weight fluctuate a little with nothing on the scale. Most common advice that we can give you is just to send it back if you think it is a defective product and ask for a new one or go to an other brand. Overall if we look at the price quality comparison this scale can be recommended for normal household use and can work great in the kitchen. 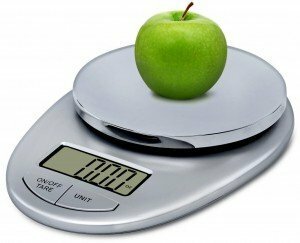 If you however think you need a higher quality and more accurate scale we suggest to have a look at a higher priced digital kitchen scale. After all we did find over 1100 people who bought this Epica Tm and took the time to write a review and some thing about their findings of this digital kitchen scale.